Q: My doctor recommended I take a calcium supplement. Which type do you suggest, and when is the best time of day to take it? A: Calcium supplements come in two forms: calcium citrate or calcium carbonate. Calcium carbonate (e.g. Caltrate®, Viactiv®, Tums®) is cheaper than Calcium citrate (e.g. Citracal®), but research has shown that under normal circumstances, the two forms are equally absorbed and utilized by the body. The exception is in cases of reduced stomach acidity, which occurs often in the elderly or if you take medications that decrease gastric acid secretion. If this is the case, then calcium citrate is the way to go. Check the ingredient list on the back of supplements and multivitamins to know which form of calcium the product contains. Calcium carbonate products should be taken with meals. Calcium citrate products can be taken with food or on an empty stomach. Along with food and antacids, calcium supplements likely inhibit the absorption of medications intended to halt bone loss, such as Fosamax, Actonel or Didronel. After taking one of these drugs, wait at least 30 minutes before ingesting anything except plain water. Calcium may prevent iron absorption, so if you’re also on supplemental iron, space the two tablets several hours apart. Healthy adults should aim for 1,000-1,200 mg elemental calcium per day. It’s important to buy a supplement that also contains vitamin D, which helps our body absorb calcium. The recommendation for vitamin D is set at 600 IU daily, but a number of researchers believe this number should even be doubled. Let’s put things in perspective…One Caltrate®600+D tablet contains 600 mg calcium plus 400 IU of vitamin D. Daily goals can be met with two of these tablets daily. On the other hand, Citracal® Regular 250 mg + D contains 500 mg calcium and 400 IU vitamin D per serving, but a serving is 2 tablets! 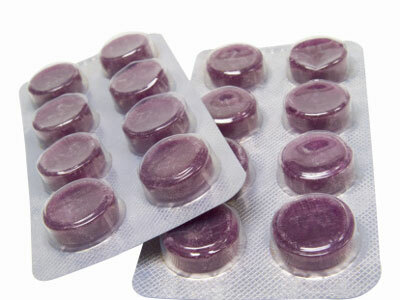 That means you would need to take 4 Citracal® tablets per day to meet the daily calcium requirement. Viactiv® flavoredchews each have 500 mg calcium and 500 IU vitamin D. Lastly, a single Tums® tablet contains 500 mg of calcium carbonate, but only 200 mg of that is elemental calcium. Bottom line? Be sure to read labels and, of course, inform your doctor of all vitamins, supplements and herbs you’re taking.